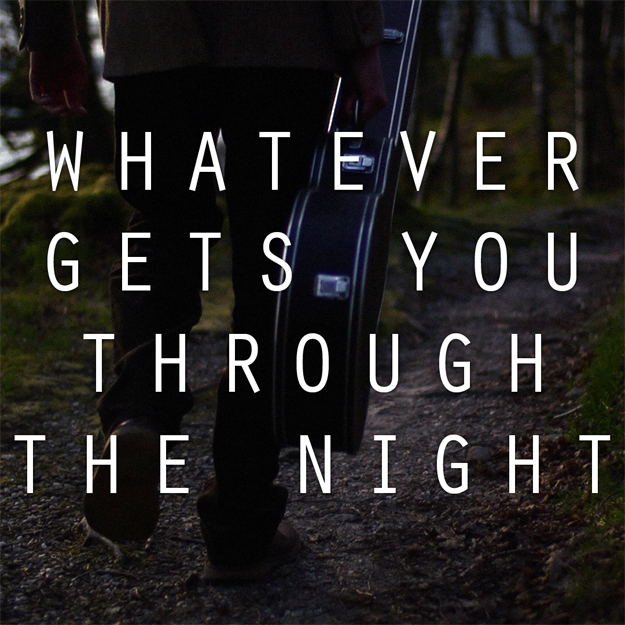 Whatever Gets You Through The Night, the album, will get a full digital release in November. The album is a compilation of 16 new songs, all inspired by the hours between midnight and 4am, by Withered Hand, Errors, Meursault, RM Hubbert, Conquering Animal Sound, Ricky Ross, Emma Pollock, Eugene Kelly, Rachel Sermanni, Wounded Knee and Bigg Taj, Cora Bissett, Talkingmakesnosense, Swimmer One, Seafieldroad and Laura Lewis & the Teadance Orchestra. It’ll be available via iTunes, Amazon and other digital retailers from Monday 4 November. The album release is just one part of a much bigger, ongoing project of the same name, created by theatre director Cora Bissett, playwright David Greig, and ourselves. 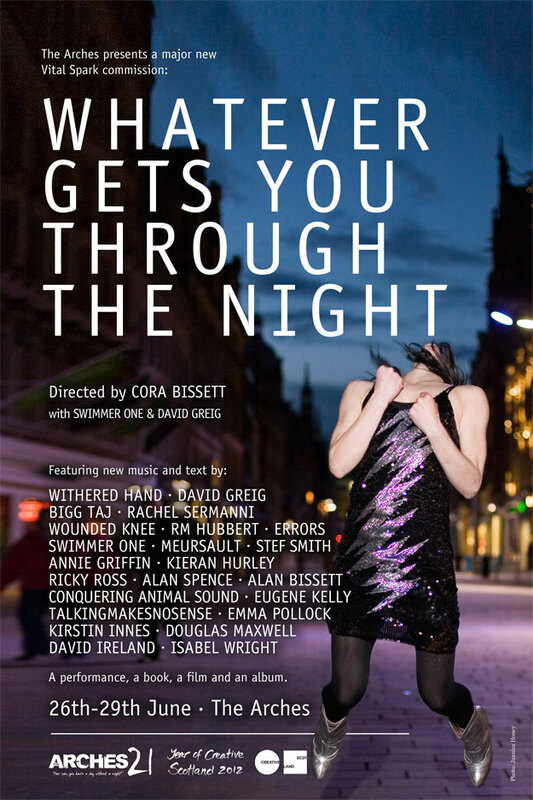 Whatever Gets You Through The Night began with a live show at the Arches in June, which sold out completely before its opening night, and got four star reviews in The Guardian, The List, The Scotsman and The Herald. We are hoping to revive the show next year. Daniel Warren’s film has also been well received, and will tour in 2013 following its premiere at the Edinburgh Fringe. 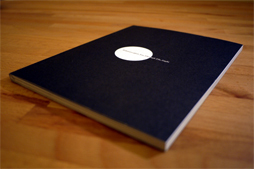 The cover image for the album is taken from Daniel’s film. This entry was posted in News and tagged Bigg Taj, Conquering Animal Sound, Cora Bissett, Daniel Warren, David Greig, Emma Pollock, Errors, Eugene Kelly, Laura Lewis and the Teadance Orchestra, Meursault, Rachel Sermanni, Ricky Ross, RM Hubbert, Seafieldroad, Swimmer One, Talkingmakesnosense, Whatever Gets You Through The Night, Withered Hand, Wounded Knee on 01/11/2012 by admin. For the past year Swimmer One and Biphonic Records have been working on an ambitious multimedia project with theatre director Cora Bissett, playwright David Greig, and The Arches in Glasgow. We’re thrilled to announce that the results will be premiered at the Arches from 26-29 June this year. 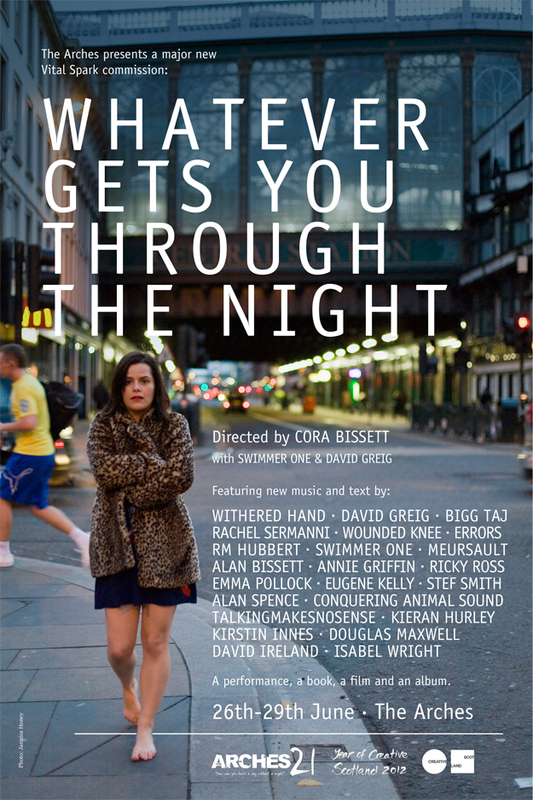 Whatever Gets You Through The Night, as it’s now called, will feature exclusive new words and music by Swimmer One, Withered Hand, David Greig, Errors, Wounded Knee, Annie Griffin, Meursault, RM Hubbert, Rachel Sermanni, Alan Spence, Ricky Ross, Conquering Animal Sound, Alan Bissett, Emma Pollock, Kirstin Innes, Isabel Wright, Bigg Taj, Stef Smith, Eugene Kelly, Douglas Maxwell, Talkingmakesnosense, and David Ireland. As well as the live show, there will be an album and book, a film by our long-time collaborator Daniel Warren (working with with Kim Beveridge, who is doing the live visuals for the show), and a collection of photography. For regular updates on the project as it comes together, see the Facebook page. 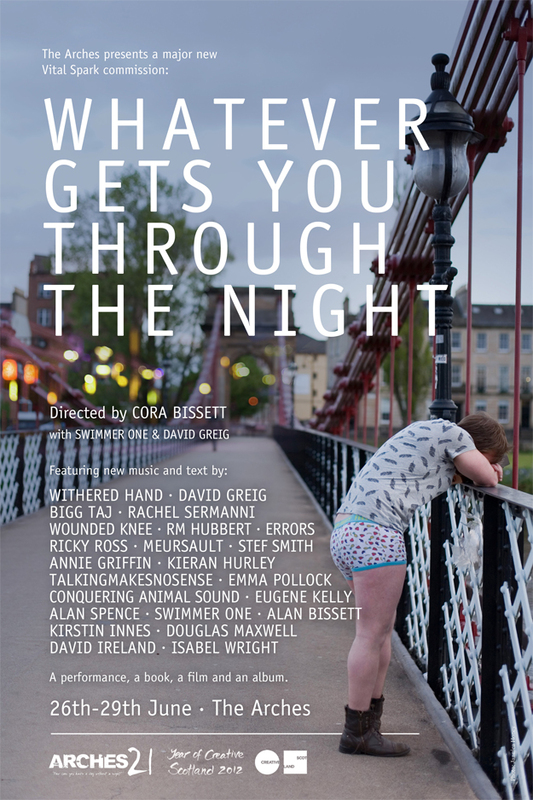 Whatever Gets You Through The Night has been made possible by Vital Spark funding from Creative Scotland. This entry was posted in News and tagged Bigg Taj, Conquering Animal Sound, Cora Bissett, Daniel Warren, David Greig, Emma Pollock, Errors, Eugene Kelly, Laura Lewis and the Teadance Orchestra, Meursault, Rachel Sermanni, Ricky Ross, RM Hubbert, Seafieldroad, Swimmer One, Talkingmakesnosense, Whatever Gets You Through The Night, Withered Hand, Wounded Knee on 12/02/2012 by admin. The second Seafieldroad album is on sale now. Quintana Films have made a beautiful short film for the album’s opening song Cramond Island Causeway. 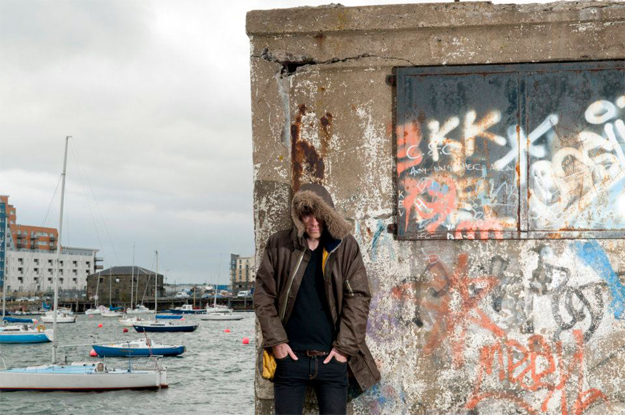 The new album – titled Seafieldroad – is the follow-up to There Are No Maps For This Part Of The City, which got some very nice reviews on its release in November last year. Artwork by Daniel Warren. The album includes a piano and vocal cover version of Walking on a Dream by Empire of The Sun. There will be Seafieldroad live dates in 2012. For updates, follow Seafieldroad on Facebook. This entry was posted in News and tagged Film, Seafieldroad on 21/11/2011 by admin.